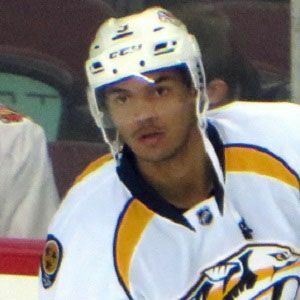 Defenseman who was selected in the first round of the 2013 NHL draft by the Nashville Predators and debuted with the team later that year. He began playing organized hockey when he was eight years old. He became known for having a hard and accurate right-handed shot, tremendous offensive upside, and his size and speed. His father Popeye Jones was an NBA forward/center. His skill and potential allowed for early comparisons to 12-time All-Star defenseman Nicklas Lidstrom.